Adil Nabi shares the same dream as thousands of Asian kids living across Britain. He just wants to play football. What makes the 24-year-old stand out from them, and the handful of Asian footballers that play across the leagues in Britain, is that he has shared a dressing room with Champions League winners Roberto Carlos, John Arne Riise and Florent Malouda. West Brom academy graduate Nabi became the first Premier League player to move on loan to the Indian Super League, when he joined Riise and Malouda at Delhi Dynamos, who had roped in Real Madrid great Carlos as player-manager. 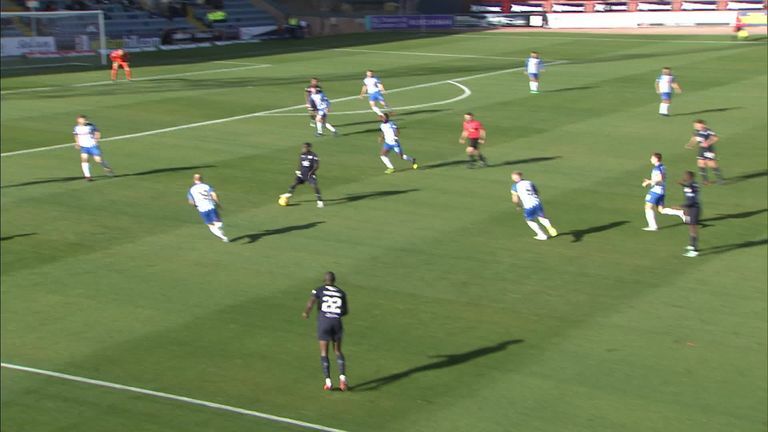 "To play with people like that and have their respect means I've got to be a good player," says Nabi, who is the only player of South Asian origin playing in the Scottish Premiership. "I must have done something right while I was out there because three years on I still talk to keep in contact with all of them. "I'm just so pleased I have had that experience and I think it has helped me settle in so quickly in Scotland because Scotland is a stone's throw away [from home for me] compared to India. "I've just taken everything I learned out there on my own into this new challenge here at Dundee. Sometimes in football, trying new things can help give you life experience, which you can then draw on as you move forward with your career. "And on both occasions - playing in India and in Scotland - I have been fortunate that they have been good experiences with positive outcomes. The experience in India was positive and hopefully it continues to be positive here in Scotland at Dundee." After two seasons with League One Peterborough, Nabi, who is of Pakistani heritage, left England for the second time in his short career to join Dundee as a free agent in August. "I could have gone to another lower league club in England but my agent suggested trying something different. And there is, of course, the added exposure of playing in a top-flight league here in Scotland," explains former England youth international Nabi. "Dundee play a good style of football as well, which suits me down to the ground. When I came to train here for a week over the summer I knew I wanted to come here, particularly as I thought I was going to get game-time. It was an easy decision for me and I signed straight away." Nabi scored his first goal in a Dundee shirt before the international break, netting the opener in a 2-1 defeat to Kilmarnock on just his second 90-minute outing for his new club. "The goal was something I'd desperately been waiting for," Nabi confesses. "As you can imagine, getting the first one out of the way is such a relief and as a forward you like to think more will come as you go along. "My little brother was also up in the stands and I wanted to score for him so that was the icing on the cake. "But it was also funny to score against Kilmarnock because their boss [Steve Clarke] was one of my old managers at West Brom. You really couldn't write that script because I could have scored against anyone! "I didn't get a chance to speak to him afterwards - I don't take losing well so I was in the changing room for a while after the game - but I learnt a lot from him at West Brom and I can only thank him for what has done for me." Nabi's younger brothers Samir and Rahis are also professional footballers. Adil hopes his exploits in the Scottish top-flight at Dundee can inspire them as well as the next crop of Asian footballers coming through. "I'm really proud and my family are really proud of what I am doing here in Scotland," Nabi says. "Football is huge, it's massive in Asian culture [here in Britain] but not many Asians get the opportunity to play professionally. I try not to let that give me added pressure when I go out on the pitch even though I am aware of it. "I don't like to think about, I just want to play my football and put a smile on their faces because if I perform they'll be happy, and I'm happy anyway. "But I understand there aren't that many Asian players out there and hopefully I can be someone who makes it easier for my brothers and trailblazes it for the other youngsters coming up - Asian or not - to ply their trade in football. "I've had a lot of ups and downs in my career but if this is the way God has planned it for me then that is the way it is. "I feel like coming up to Dundee is a real turning point for me now in my career, especially with the goal coming in the last game. I'm looking forward now and I know my future is bright."